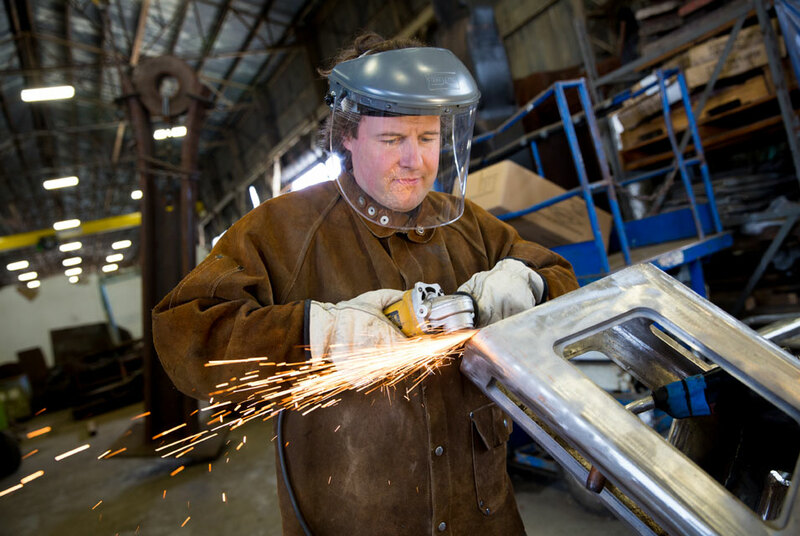 Sculptor Julian Voss-Andreae works on assembly of 'Synergy' sculpture for Rutgers Univ. PORTLAND, ORE.- Sculptor Julian Voss-Andreae has been commissioned by Rutgers University to create an original sculpture to celebrate its new Center for Integrative Proteomics Research (CIPR) and to honor its founding director, Dr. Helen M. Berman. Rutgers, one of the top research universities in North America, is a world leader in bio-medical research. Voss-Andreaes 20-foot, 3,200-pound polished stainless steel and colored glass sculpture, Synergy, is based on the collagen molecule. The monument will be formally unveiled at Rutgers in late September, coinciding with a symposium honoring the career and contributions of Dr. Berman. Collagen, the most abundant protein in humans, provides structure to the body by forming long molecular ropes that strengthen the tendons and vast, resilient sheets that support the skin and internal organs. Collagen also serves as pathway for cellular movement during development and growth. Voss-Andreae has been using the structural data provided by Protein Data Bank since creating his first protein sculpture in 2001. No stranger to molecular biology, Voss-Andreae, himself, is a scientistturned sculptor. Voss-Andreae studied physics, mathematics and philosophy at the Universities of Berlin, Edinburgh and Vienna, pursuing his graduate research in quantum physics. The sculptor began as a painter, then changed course to move into science. He eventually moved to the United States to study sculpture, and graduated from the Pacific Northwest College of Art in 2004. "My goal is to create something beautiful and wonderful that works as art for an audience even without scientific knowledge," says Voss-Andreae. "This sculpture reflects some true aspects of nature, by echoing the structure of one of our own major building blocks. When people realize that, it suddenly dissolves the artificial divide between art and science." Voss-Andreaes subject matter is not limited to the scientific world, yet his background in science has clearly been an influence. In very different work, the sculptor has focused on such time-honored themes as the human figurewith a modern twist. He created Quantum Man' (2007), an audience's favorite at the Maryhill Museum of Art in Goldendale, Washington. The stylized human walker almost disappears when the viewer moves past the sculpture fashioned from parallel slices of thin steel. Synergy, for Rutgers, is being crafted now, in Voss-Andreaes studio, one piece at a time. The sculpture will feature over 200 glass windows, all of different shapes determined by the structure, running the length of each strand. Each of the strands will be a different color, using glass lightly tinted in the three primary colors of yellow, red, and blue. The sculpture will be illuminated from within at its base and from the outside by flood lights, giving it a strong visual presence at night, as well. This sculpture physically and symbolically manifests the union of science, medicine, and art; cross fertilizations that enable enhancements to the human condition. says Dr. Kenneth J. Breslauer, Rutgers. Julian Voss-Andreae is a German sculptor based in Portland, Oregon. Starting out as a painter he later changed course and studied physics, mathematics, and philosophy at the Universities of Berlin, Edinburgh and Vienna. Voss-Andreae pursued his graduate research in quantum physics, participating in a seminal experiment considered one of the modern milestones of unifying our everyday intuition with the famously bizarre world of quantum physics. He moved to the United States to study Sculpture at the Pacific Northwest College of Art from where he graduated in 2004. Voss-Andreaes work has quickly gained critical attention. His sculpture, often inspired by his background in science, has captured the attention of multiple institutions and collectors in the U.S. and abroad. Recent institutional commissions include large-scale outdoor monuments for the University of Minnesota and Rutgers University (New Jersey). Voss-Andreae's work has been featured in print and broadcast media worldwide. Museum of Contemporary Art Australia opens "string theory: Focus on contemporary Australian Art"